This week isoHunt announced its shutdown as part of a $110 million settlement with the MPAA. The decision is the end of an era for a BitTorrent icon that served millions of people for more than a decade. Recognizing this historical value, a group of rogue archivists have taken it upon themselves to backup all isoHunt data before the site vanishes. With roughly three terabytes of data, ArchiveTeam's #isoprey project is one of the largest web-preservation operations in history. The Canada-based search engine isoHunt is not just one of the oldest but also one of the largest torrent repositories on the Internet. At the time of writing isoHunt consists of 13,773,786 torrents linking to 286 million files which are good for a total 17,390.44 terabytes of data. Unfortunately, all of the site’s metadata may soon disappear. After a legal battle of nearly eight years isoHunt founder Gary Fung announced the site’s closure this week. Fung signed a $110 million settlement with the MPAA and agreed to shut down the torrent site by October 23. While isoHunt.com will soon be gone, the site’s torrents and other metadata will be preserved if it’s up to the ArchiveTeam. In an attempt to save isoHunt’s extensive collection of torrent files, a group of “rogue archivists” has been working around the clock to save all data for future generations. TorrentFreak talked to several ArchiveTeam members, each determined to prevent one of the largest metadata massacres in history. “The settlement took everyone by surprise, and appeared to come out of nowhere. IsoHunt is shutting down in less than three days, and the speedy massacre of such a significant volume of metadata is a tragedy,” ArchiveTeam’s ‘lysobit’ informs TorrentFreak. “This project isn’t about politics or copyright issues. This is about preserving culture and historical metadata. All data is essential,” he adds. The ArchiveTeam gathered fame in 2010 when they released a full backup of all Geocities websites before Yahoo! pulled the plug for good. The archive was released as a 641 gigabyte torrent and made headlines all over the Internet. The backup of isoHunt, which is still in progress, is expected to be nearly five times larger. The ArchiveTeam believes that all torrents, comments and other metadata will be around three terabytes when its complete. At this point it is still uncertain whether they will be able to finish the project in time. IsoHunt is expected to disappear in a few days and the ArchiveTeam is still looking for volunteers to assist in the backup process. “People who are interested in supporting our effort of preserving the data contained on isoHunt can do so by following the instructions on GitHub for their platform. The script works by downloading metadata in bulks of 50 and uploading a compressed archive of them to a central server via the ‘Warrior’,” ArchiveTeam’s ‘Fionn’ told us. According to ‘joepie91’, founder of the isoHunt archiving project, the rescue operation is a prime example of what the ArchiveTeam is for. The people involved in the team’s projects want to make sure that important data doesn’t get lost whenever a site shuts down. “Many sites shut down over time – either outside of their own control, or due to an acquisition – and most of these sites don’t really care about their users, or the content they host. 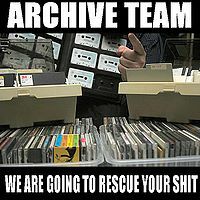 ArchiveTeam is a loosely organized group of ‘rogue archivists’ that keeps track of impending shutdowns, and saves all data that can be saved before it’s gone forever,” joepie91 told TorrentFreak. “While there is some coherence, and some services are controlled by a smaller group of people, the general idea is to ‘just go get it done’. ArchiveTeam has developed a reusable toolkit for developing archiving scripts compatible with the ‘Warrior’; a system that anyone who runs the script can join to receive automated archiving tasks, making the whole process distributed and quicker,” he adds. If the ArchiveTeam is able to get the backup done in time, isoHunt will write history again when the torrent becomes available. As far as we know, a three terabyte isoHunt archive is going to set a record for the largest torrent ever distributed in public. Update: isoHunt has taken down its servers to prevent the site from being backed up. We hope to have more information on the current status of the backup later. c There are 108 comments. Add yours?